description SketchUp 6 or higher. Two scripts for one low price! Smooth transitions between pages for constant speed, and edit each scene's transition times or delay times in a NEW webDialog box. The NEW webDialog responds to changes as you add, delete, and remove scenes from the slideshow (the webDialog shows only the scenes used in the slideshow, to save screen space). 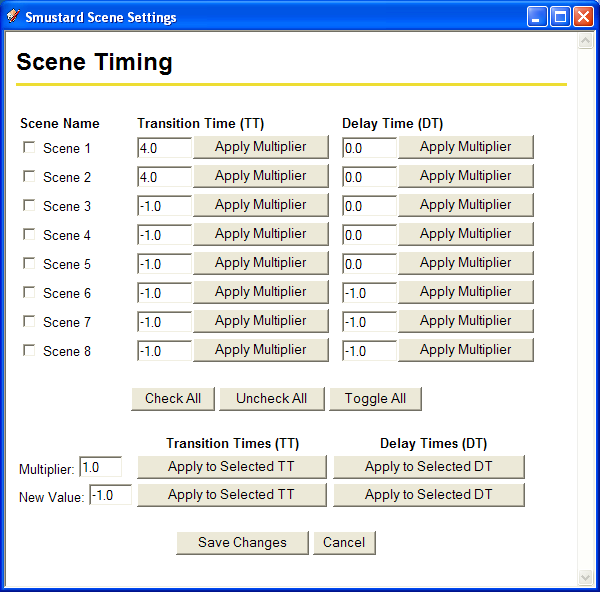 You can change a scene's Transition Time (TT) or Delay Time (DT) manually by entering a new value in the box, or you can apply a multiplier (either an integer, a decimal, or a fraction) and apply the multiplier to many selected scenes at once. You can also use a set value instead of a multiplier, in the same way. A value of -1 reverts to the global values set in the Model Info dialog box. Upgrade pricing now available for current PageUtilities customers. Check your "MySmustard" page for details.